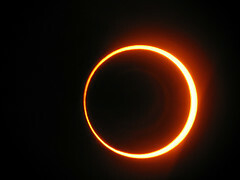 An annular solar eclipse is not a “total” eclipse, so the moon will not completely block the Sun. Instead, the Sun will look like a very bright ring (also known as an “annulus”), like in the photo on the right (which was taken during the annular solar eclipse of October 3rd, 2005). So, why am I telling you this over a month ahead of time? Wouldn’t it be nice if you had more than a couple of days to think about a cool composition for an eclipse or think through a time-lapse film of a meteor shower? So, I’ve decided to keep better track of events like this, and it’s one of the things I’ll be including in our new weekly newsletters that go out every Thursday night. Each week, I’ll include a list of upcoming astronomical events, so you can plan ahead for creating some epic images. The list will include everything from full moons to meteor showers, to any type of eclipse. It’s now on my calendar. Thanks! We’ve already planned a trip to see the eclipse in central Nevada. With such wide open landscapes and dramatic mountains for backgrounds, we are excited for this opportunity.